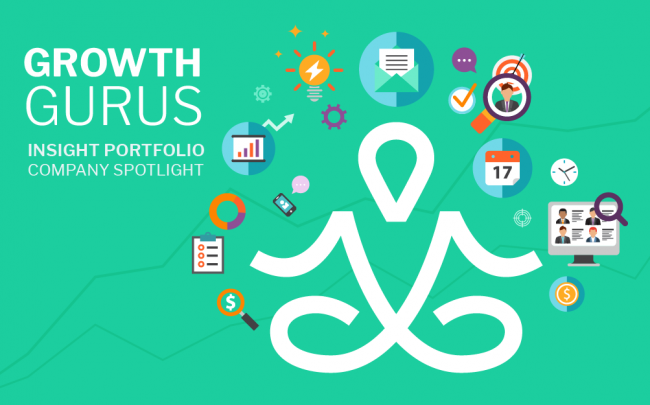 This blog post is an excerpt from "Accelerate Your Business Growth With OKRs", an article written by our contributing writer, Edward Jackson (Head of Marketing at Vinted). To read the entire post, please click here. 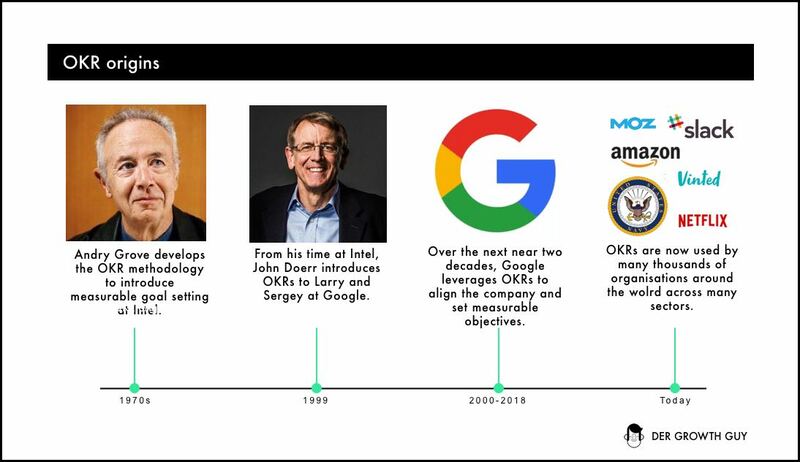 OKRs were originally created at Intel by Andy Grove in the 70s, and pioneered by a number of companies such as LinkedIn and Twitter, and made famous by Google. You don’t need to be a tech startup to benefit from the OKR system. Today, OKRs are used by thousands of diverse organisations throughout the world, from tech companies like Netflix, to Government organisations like the US Marines. So whatever your business, consider the approach to be relevant to you and your business! OKRs are an an operational framework used to connect the outputs of each individual and team in the organisation with the company’s strategic direction. 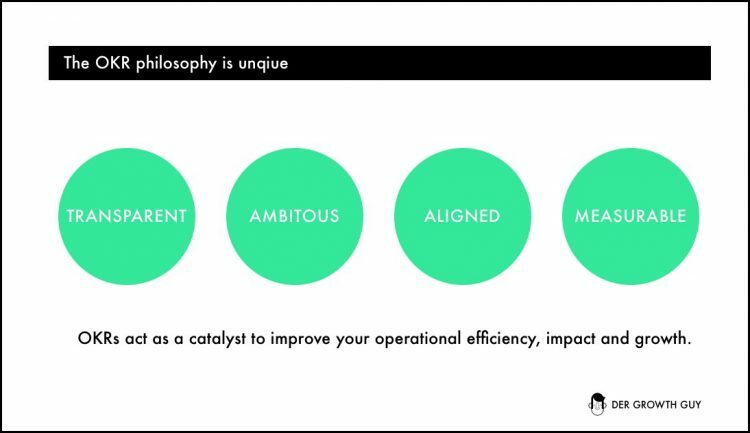 If applied correctly, OKRs can transform an organisation’s efficiency and output by aligning them behind common corporate goalsâ—âin the present context, growth maximisation. Objectives, which outline the direction in which you want to take or what you would like to accomplish. They should be unified throughout the organisation from the top and should cascade down throughout the organisation, grouping under common goals. Key results, which should outline how you intend to get there. These are indicators of whether you have been successful in achieving the said objectives. They should be measurable, limited in number (in my experience, ideally no more than 3), have a deadline and be ambitious but achievable. (The personal performance tensions influencing the latter are discussed below).At Vinted, we created both annual and quarterly OKRs. Annual OKRs are created at the beginning of each year and run for the whole year, whilst they are reported on quarterly. The main use of yearly OKRs is to think big in terms of your objectives and direction, to avoid any tunnel vision emerging when defining your strategy. Quarterly OKRs are set at the beginning of each quarter and run for the whole quarter. At the end of each quarter, OKRs are scored and then new OKRs are created. At Vinted we utilize quarterly OKRs as our main performance tracker and report on progress weekly. How can OKRs help you and your business grow? Well the short answer is that they provide you with a set of ambitious measurable objectives, which bring clarity, alignment and a singular unified direction to your business. This in turn raises the impact, efficiency and focus of not only you output but that of the entire organisation. Transparency: Enables positive communication, collaboration and prioritisation between teams. Ambition: They enable you to garner an ambitious performance culture. Alignment: OKRs align people and teams around common strategic growth goals. Measurable: They provide your business, teams and individuals with a measurable framework for tracking progress and success. 1. Agree on OKR owners and train them! Start by deciding who in your organisation is going to own OKRs. There is no right or wrong answer to this, but ensure that there is coverage from across the organization. At Google, practically the entire company used them, whereas at Vinted it varied from org-to-org based on level. Ensure that each OKR owner understands what OKRs are, why they are important, how the process works and how to create growth-based OKRs. Create a google spreadsheet: By far the easiest method is to create a Google spreadsheet similar to this one here, where all the owners’ OKRs will be housed. This works fine for smaller organisations where all the owners’ OKRs will be kept under one document/multiple tabs. At Vinted (a 120 employee company), we still use a Google spreadsheet and it works just great! Buy an OKR tool: If you are a larger organisation then you might consider buying one of the many dedicated OKR SAAS options (e.g. http://okrsoftware.com/). Build your own: At Google, they had built their own internal OKR tool which aligned with the rest of the internal HR system. I wouldn’t recommend this solution unless you are absolutely convinced that your company will work with OKRs in the long term as it’s obviously a complex and more costly solution. A leaner approach is to go with one of the other two options above. 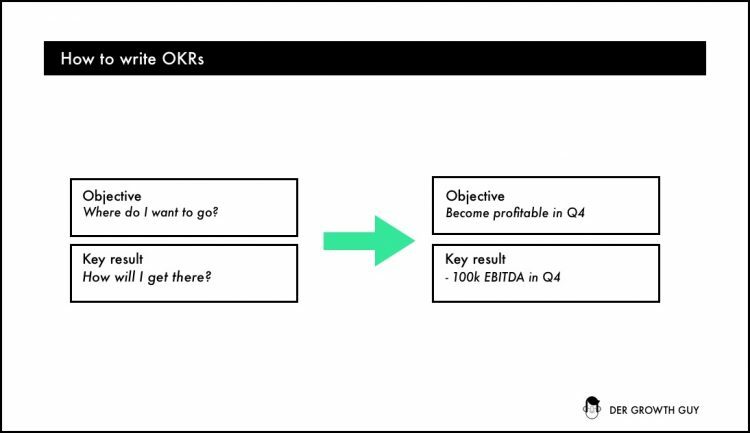 Start by drafting the OKRs in the business from the top of your organisation, by agreeing on the senior management team OKRs first. These should be agreed between the CEO and the rest of the leadership team and based on the primary objectives required by the company and based upon the latest financial business model. It’s important that whether you are the CMO, CPO or CFO, your goals cascade down from the CEO and should be either concerned with growing the business or doing something to earn more cash (either by raising additional cash or ideally by making efficiency savings) which can be re-injected into the business to reinvest into growing the business further. 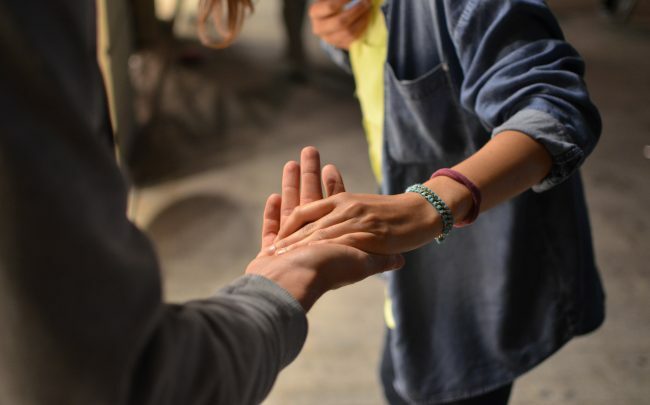 For example, the Head of Customer Support might take ticket resolution, NPS and headcount costs as his three OKRs, as he understands that happy customers mean better retention and, potentially, more growth. 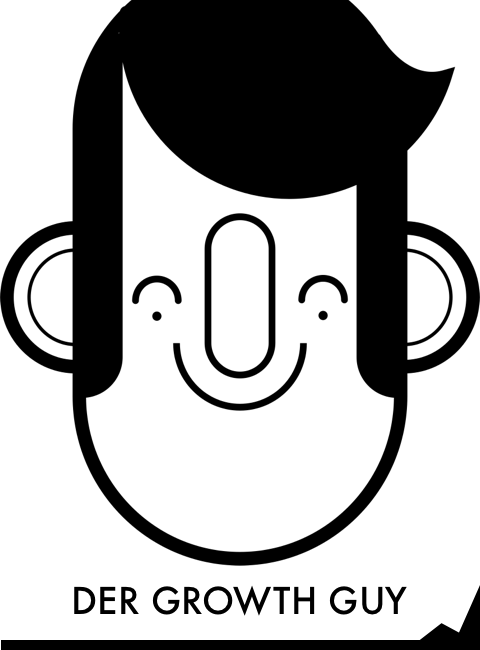 And in terms of cost, he knows that controlling headcount costs will ensure better OPEX and earnings. After you’ve agreed on the top level draft OKRs, they should be shared with the broader organisation. 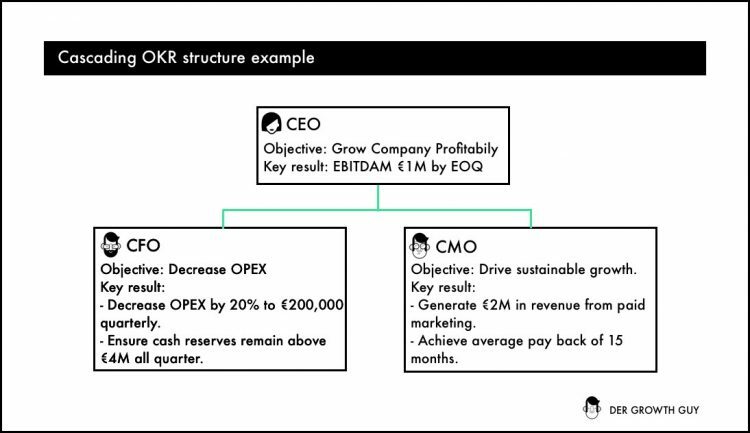 Ask the remainder of the organisation to create their own OKRs in a way that aligns and cascades down from their senior line managers (see the cascading OKR structure image above). Each OKR owner should ensure that they have aligned their OKRs with other stakeholders with whom they share project results (e.g a Product Manager and a Product Marketing Manager agree key results on product adoption). Each line manager and line report should feed back on each other’s OKRs, to ensure that OKRs cascade, and fall under the same focus areas. This creates vertical alignment throughout the organisation and helps to prevent disagreement over prioritisation and how ‘stretched’ certain results are. If this process is done effectively, there should be alignment from the CEO right down to the most junior level in the organisation, all stemming from the business model and strategy. Objective: Drive sustainable revenue growth in Q4. Key result: acquire 40,000 customers with an AOV of €50 and achieve average CPA per adoption of €100. 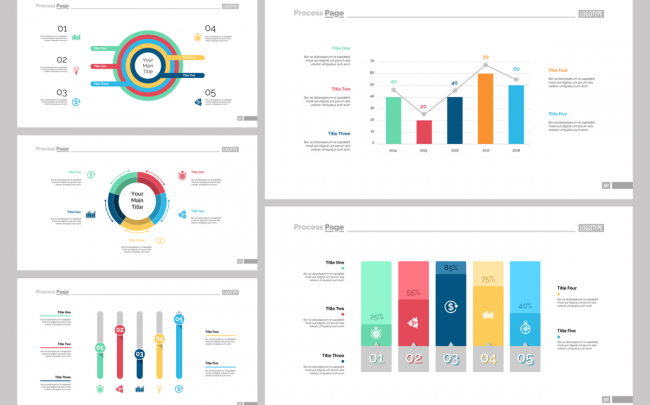 At the end of each quarter the OKRs are scored and then a new set of OKRs are drafted. This process is continuous. Ensure that your team’s strive to create focused OKRs. This means that they should set 1 to 3 Objectives and 1 to 3 Key Results per objective. This, in my experience, is the “sweet spot.” At Google the guide was to have up to 5 key results, but I found that this led to a lack of focus. Your Objectives should be memorable qualitative descriptions of what you want to achieve. Objectives should be short, inspirational and engaging. They should also be ambitious and feel somewhat uncomfortable. They answer the question “Where do I want to go?”. Your Key Results are a set of metrics that measure your progress towards an objective. Key Results are quantitative and measurable. They answer the question “How will I know I’m getting there?”. When Key Results are directly related to fiscal results: In some businesses it may make sense to have two targets for each key result. At Vinted we set a 0.6 score and a 1.0 score. The 0.6 score is what you confidently think you can achieve (realistic) and the 1.0 is a more stretched goal. This approach enables us to think big, whilst at the same time helping us to improve the accuracy of financial forecasting, by aligning our model closer to the 0.6. Wherever possible we also break these key results down monthly, so that we can report on how we are delivering more frequently. 1.0â—âStretch = Oct (+333k), Nov(+400k), Dec(+400k). 0.6â—âConfident = Oct (+232k), Nov(-235k), Dec(+8k). Eddy Jackson, Head of Marketing at Vinted. Previously worked in Product Marketing at FB and Google. Author of 'Der Growth Guy'. Passionate about sharing insights to help marketers achieve hyper-growth!